The Salvation Army’s Divisional Headquarters site is a four-acre parcel along North Broad Street in Philadelphia that serves many functions beyond being the regional command center for Delaware and Eastern Pennsylvania. It also houses a residential shelter; the offices, warehouse, and vehicles for the organization’s Emergency Disaster Services (EDS); and a recreation center used by residents, local schools, and the larger community. As a result of being developed piecemeal over time, the site did not function or present itself as well as it could. The Salvation Army desired a comprehensive Master Plan to satisfy the needs of staff, residents, and visitors. TEND’s plan proposes improvements to parking lot flow, site egress, security, and outdoor use areas, as well as higher-level planting, street trees, and a new building for EDS. 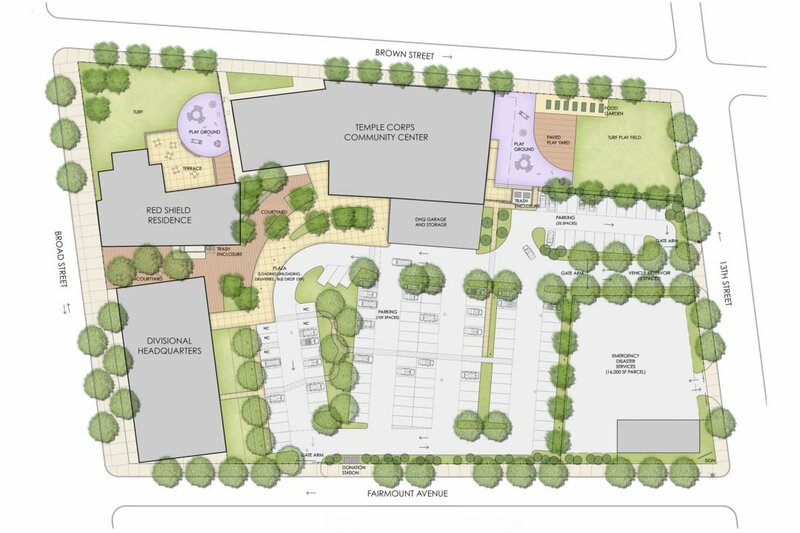 TEND is presently collaborating with the Salvation Army, Studio 6mm, and Tantala Associates on design development and implementation of Phase 1 of the Master Plan. TEND has performed an assessment of the existing trees to facilitate arboriculture work and a tree management plan.